Today I’m sharing with you Beautiful Ideas for How to Use Wallpaper in Modern Home Decor. 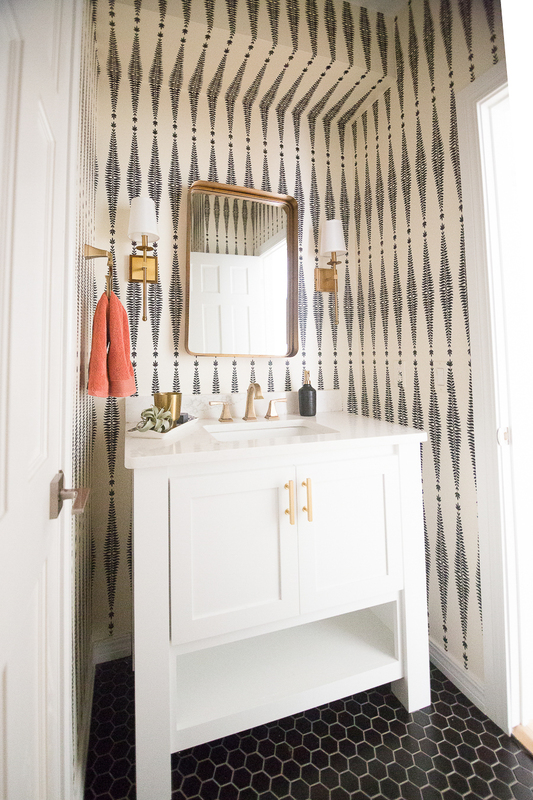 Without a doubt, bathrooms, bedrooms, and the home office or women’s desk area are my favorite places in the home to use wallpaper and I’ve rounded up some of my favorites from our own personal home, some of our projects and even a few of my friend’s homes to show you some beautiful ideas for how to use wallpaper in your own modern home decor. You will see examples of wallpaper selections from all of the five sources listed above in the following post and you can shop all of my favorite wallpapers by clicking on the links below. 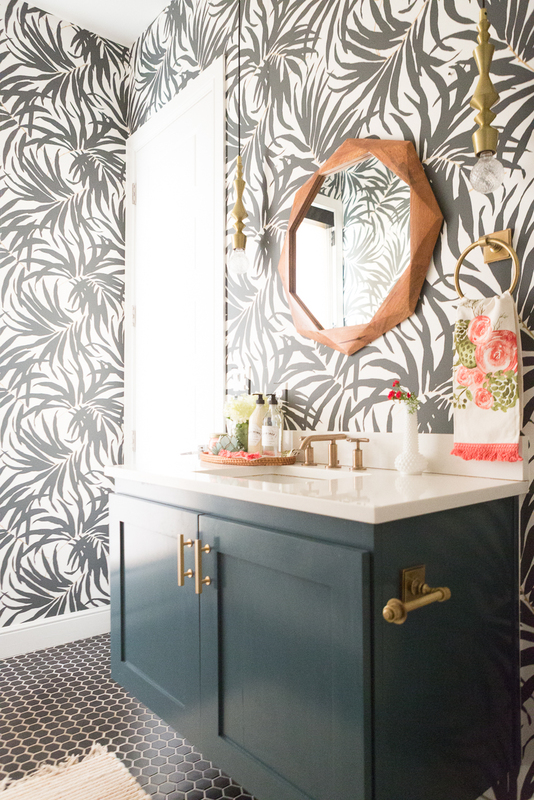 Let me say if you are a wallpaper newbie, I like to recommend a black and white wallpaper to start with like the Robert Schumacher ferns or the Palm print we used in our pool bathroom. I have also sourced several other black and white wallpapers for you. 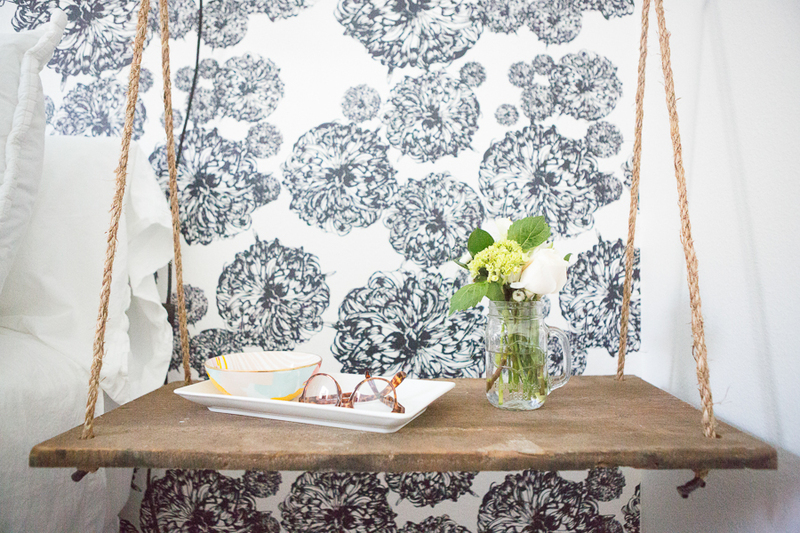 I just think a black and white wallpaper is a fun way to ease into using wallpaper for your first time. 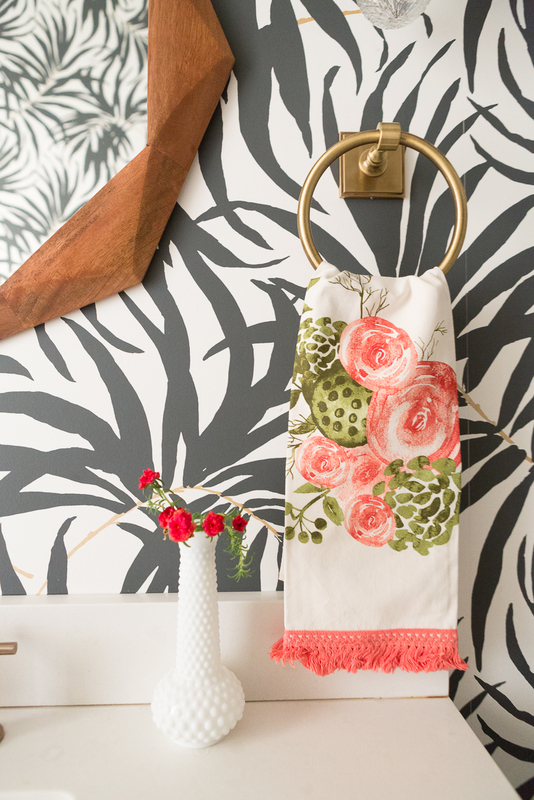 If you have used wallpaper before and you know you love it, then go for it with one of the more bold prints! 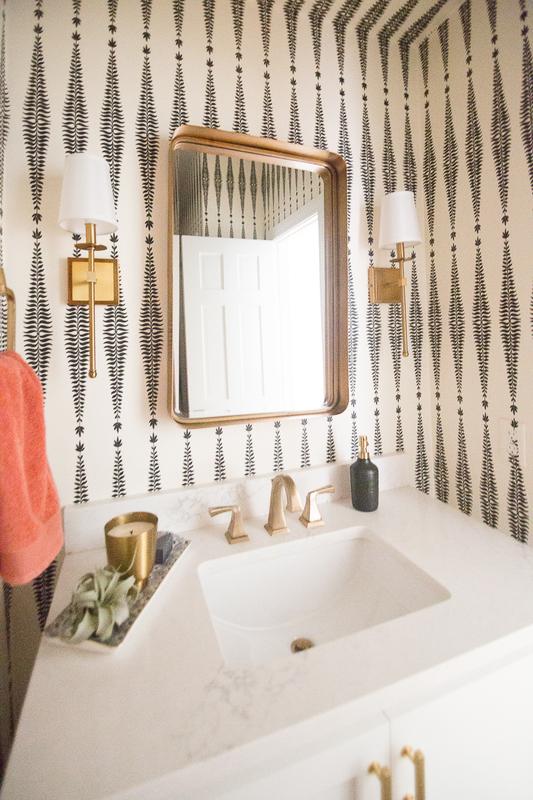 Why do I love to use wallpaper in bathrooms? 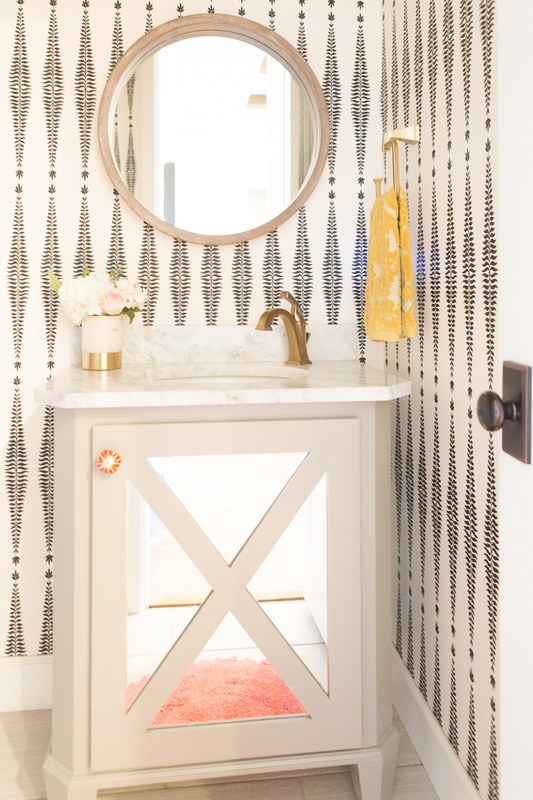 There are many reasons, including that Mike Miller gets real testy when I start telling him I want to wallpaper a big space, so my solution is to choose smaller spaces — like bathrooms! 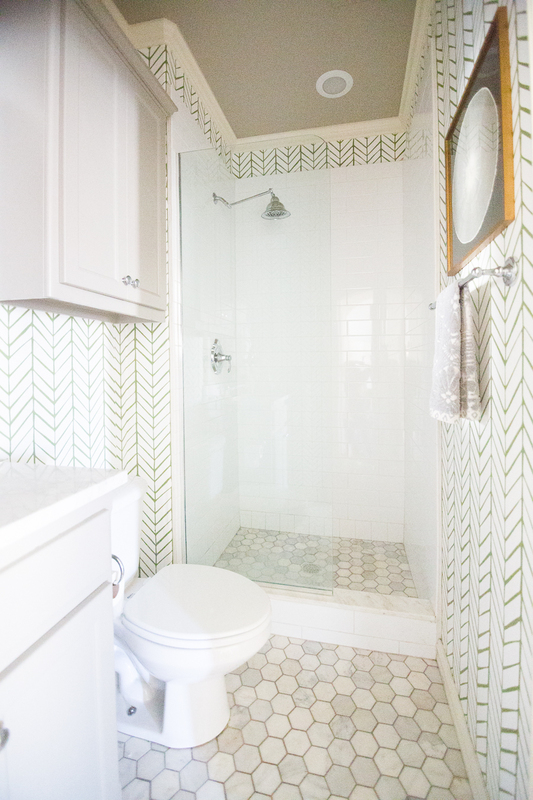 Wallpapering a small space like a bathroom is also more cost-effective than doing an entire large room. 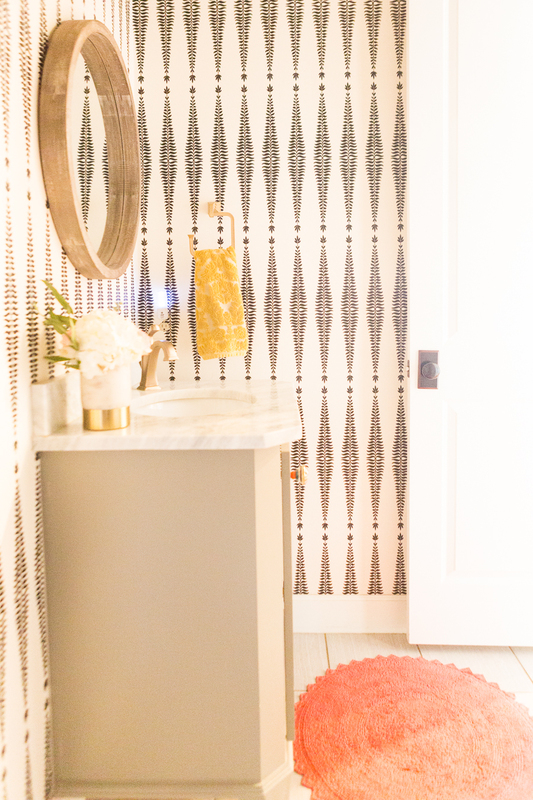 Another reason I love doing wallpaper in bathrooms is because it is bathrooms are a “safe” place to just have a little fun and go crazy like I did in our pool bath. 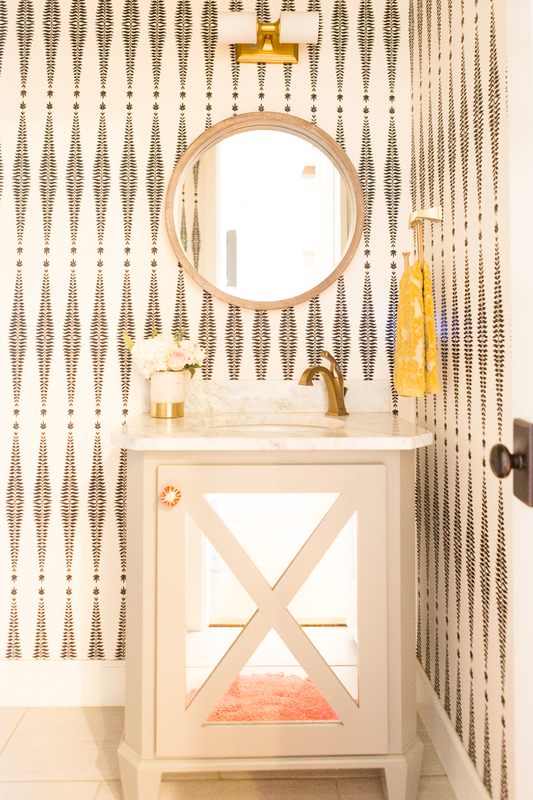 Bathrooms are an enclosed space and that makes them ideal for being a little more bold with design choices so go ahead and do that wallpaper it’s just a bathroom after all. I chose this Anthropologie fronds silhouette wallpaper for our pool bathroom and I couldn’t be happier with the choice. I love it paired with the black hexagon tile floors and the drop down gold pendant light fixtures from cb2. Our vanity is painted Benjamin Moore Newburg Green and we paired it with gold hardware from Lewis Dolin (see sources below). Here are some other bathrooms that I recently photographed from two of my friend’s houses, Amy Stone and Molly Wilson. They also decided that the bathroom was the perfect place to go bold and try some wallpaper. 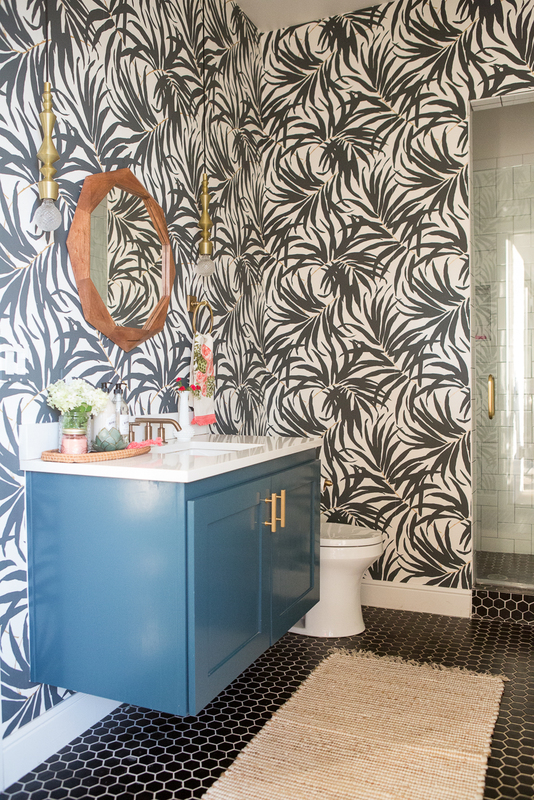 They chose the Robert Schumacher ferns wallpaper and Serena and Lily feathers wallpaper which are both gorgeous selections if you are wanting to try some graphic wallpaper for your bathroom. Bedrooms are another favorite space that I love to use wallpaper. Doing an accent wall in a bedroom is one of many Beautiful Ideas for How to Use Wallpaper in Modern Home Decor. Doing an accent wall in a bedroom is a cost-effective alternative to doing the entire bedroom. 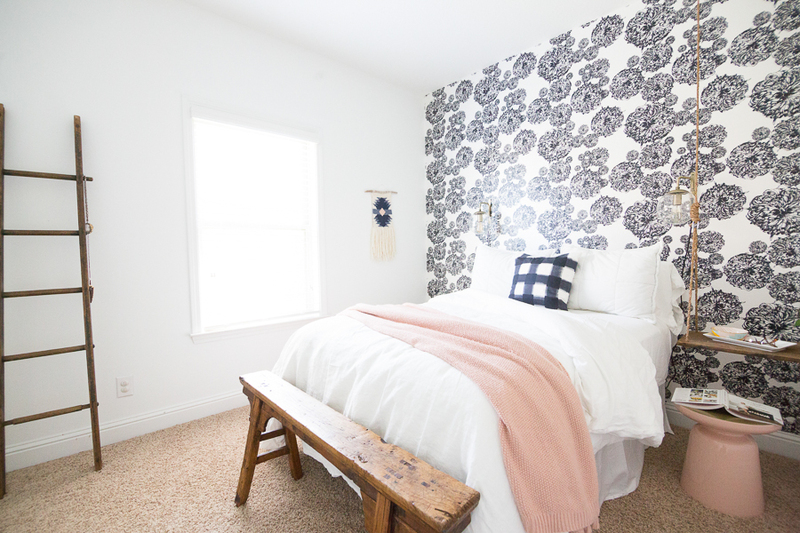 It’s not necessary to wallpaper the whole room but instead, just choose an accent wall like this bedroom from my best friend, Molly Wilson’s, home. 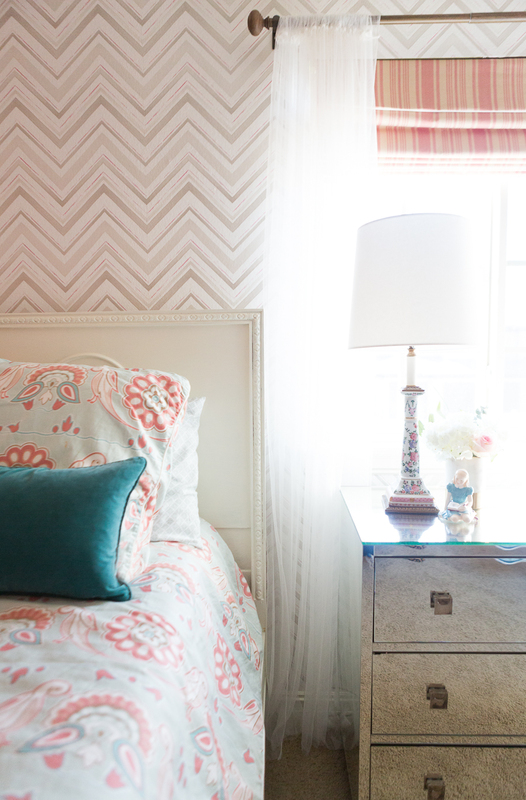 She chose to accent the window and bed wall with this adorable zig-zag wallpaper. If you like this wallpaper, here are some similar wallpapers you might want to try. 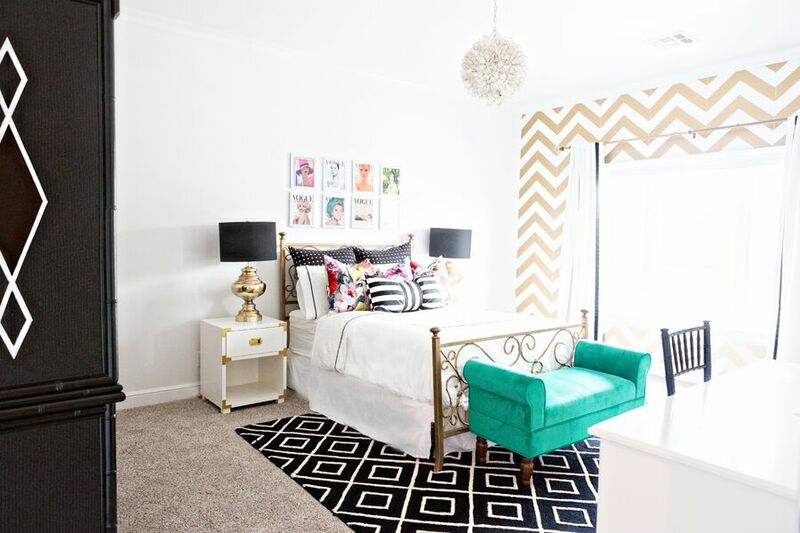 Here is another gorgeous bedroom by my friend Nicole from Grace in Magnolias. I love how she used this MK Wallpapers navy and white floral wallpaper and it’s a perfect example of how to use wallpaper as a bold accent wall in a bedroom. Also, if you don’t follow Nicole you are missing out on some major design inspo so head on over and give her a follow on insta. Just look at this amazing room and are you kidding me with that swing as a nighstand? Adorable. Here is yet another area I used wallpaper which is in Little Momma’s Vogue Bedroom. I used peel and stick removable wallpaper from Wal-Mart in both her bedroom on an accent wall and in her sitting room for an accent wall and book sehlf lining. Removable wallpaper is a nice way to ease your way into the wallpaper game if you are a little unsure because it is easy to install and easy to remove. Another favorite area I love to use wallpaper is in the home office or women’s desk area of a home. It’s fun to use wallpaper for a fun pop of color and texture behind bookshelves in the desk area. Here is another beauty from my friend Nicole. 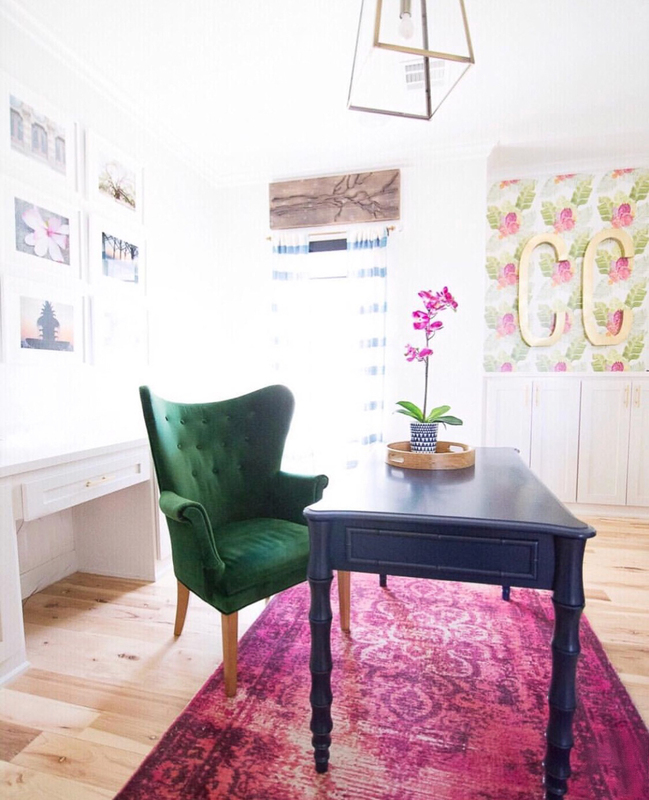 I love how she used wallpaper in this fun little desk area in her home. And here is one from my own personal home study. You will see that I used the Anthropologie Watercolor Flora paper in this alcove and also as backing in the shelving area of my home office. 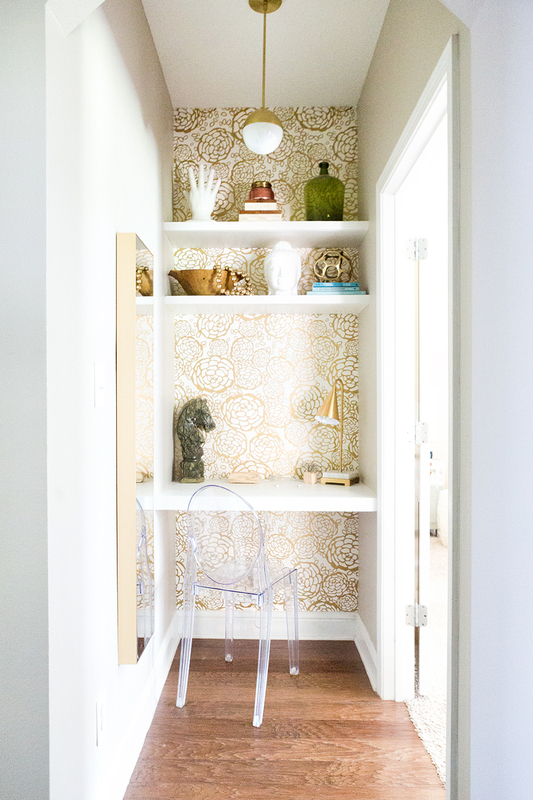 If you want to go with a really bold wallpaper, a shelf or alcove or even an accent wall in the home office can be a fun idea! Thank you for stopping by to check out these Beautiful Ideas for How to Use Wallpaper in Modern Home Decor. I hope you find some inspiration for your own home and I hope you find the courage to step out and make a bold choice in design and give wallpaper a chance!